In the feedback for Assignment 1 Dave, my tutor, suggested that for the next one, I limit myself to an area one kilometre square, to try and establish more thematic continuity between pictures than I had managed in the first assignment. Fairly early on during part two, I had identified that I should be able to get all the elements needed for the pictures in Jubilee Park, Leyton and had even begun to take some pictures as ‘sketches’ for the early point pictures. Then I went off on holiday to Orkney. At this point, I had pretty much all the photographs I needed for the first 5 exercises of Elements of Design, and some for the remaining three exercises. During the first week in Orkney, I got quite a few of the others. While I did manage some sorting and editing of pictures, I had also intended to spend some of my time writing up the exercises and the reading I’d been doing in my log, but of course time in the evenings seemed better spent with relatives or drinking beer with friends or just staring into space. Which is as it should be on a holiday, really. Then the one large chunk of time I was going to get to spend on my own (abandoning children, partner and all for a whole day) came round with a forecast of clear weather. I decided to go to take a ferry to one of the smaller islands and spend the day exploring and taking pictures. The idea that I could take the assignment pictures there began to form in my head. I wrote down the photo requirements for the assignment in my day book, charged batteries and made sandwiches, and set my alarm to allow me to catch an early ferry. The word Flotta means “flat island” in old norse and at its highest point, the island is only 59m above sea level. From the trig point you get a very good idea of Scapa Flow laid out around you: there’s the two main towns on the mainland – Kirkwall and Stromness – and also have a great view southwest into Longhope bay and of the various even smaller islands scattered to the north and the south. The mouth of Longhope bay is guarded by two martello towers built to protect convoys before they set out for Canada during the American war of 1812. During the two world wars, you’d have seen the fleet at anchor in Scapa Flow, and also the boom defences (big, heavy steel nets, hung from floats) used to close off the two main ways in and out of the anchorage. There were gun batteries built on the east and south sides of the island and the fleet control centre stood at the south-east tip. There were anti aircraft batteries and searchlights and barrage balloons. It was a busy place during the war, and there was a large (1800 seat) cinema and concert hall, over by the two piers on the west side of the island. Many of these buildings and emplacements are still there, and in a fairly good state. Now, the boats anchored in Scapa Flow are likely to be tankers, waiting to be loaded with crude from the Flotta Oil Terminal, whose rows of storage tanks are fed by a pipeline from the Forties field in the North Sea. 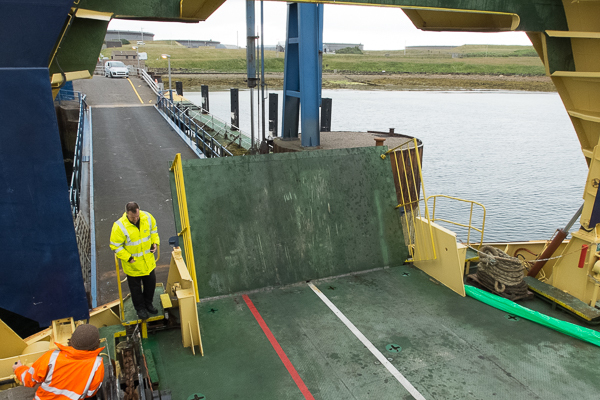 These waves of activity – war, war, oil – have fed into Orkney’s economy topping up the islands’ finances way beyond the level that it could have reached relying on agriculture alone. Flotta has been at the centre of all this, as it is at the centre of Scapa Flow. It’s population is low (under 80, I think, and most of them retired), and the primary school closed a couple of years ago when all the children on the island had gone to the secondary school in Kirkwall. Most of the oil workers commute out from the mainland, but the island isn’t completely dead. There’s still a post office; land is farmed; boats come and go. On Friday 1st August this year, I was heading out from Lyness on one of them, with 7 hours to explore and take pictures before the last boat back in the afternoon. The ferry puts you ashore on a slip in the middle of the western side of the island and I had decided to walk round the southerly loop, only going out along the thin peninsular to the north if I had time before the ferry returned to take me away in the afternoon. 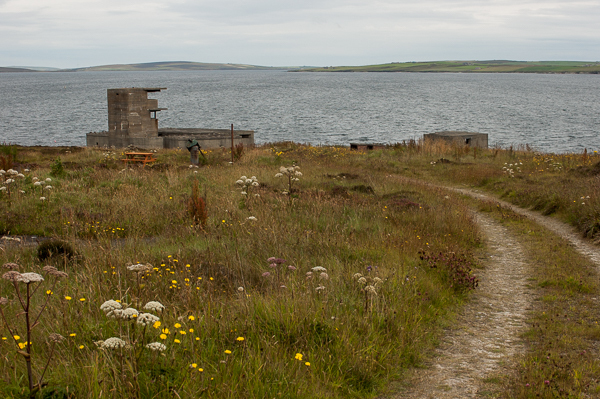 On my way, I intended to visit as many of the gun batteries on the east side (overlooking Hoxa Sound towards South Ronaldsay) and the south side (overlooking Switha Sound towards Hoy) as I could. I also wanted to take in the Fleet Direction Centre at Stangar at the south east point of the island. Then I’d follow the coast back round to the slip, passing the airstrip that had been built for the construction of the oil terminal in the 70s and the cinema on my way. This entry was posted in ASSIGNMENT 2, ASSIGNMENTS, The Art Of Photography and tagged aop-2, days out, elements of design, expedition, flotta, lines, orkney, points, shapes on September 8, 2014 by Simon Chirgwin.